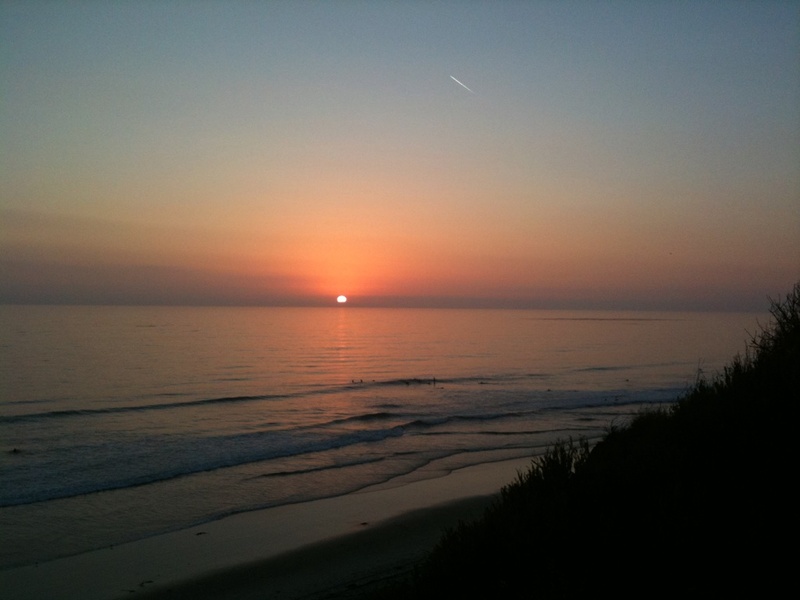 Above is a photo of last night’s sunset over Swami’s surf break in Encinitas. Stunning!!! Small swell and longboarders sliding all over. Just finished Pranayama practice with Tim and crew. Excellent session. Tim is walking us through step by step with details along the way. It is so good to hear all of this again and broken down in this fashion because it just sets in deeper each time. I am finding myself really enjoying the pranayama practice. What I really appreciate is that we are learning/practicing the exact practice Tim learned 30 years ago from Pattabhi Jois. In this respect there is something very special about learning this tradition in the fashion that it has been passed from teacher to student and generation to generation. This facet of learning produces a connection to an oral tradition that has remained in tact and when surrounded by Tim’s expertise here feels very strong and alive!! As we sat in a circle, the sun rose from the east and slowly illuminated the space and it felt so warm and relaxing. I am so happy to be here. The yoga practice has this profound capability to open us up to our true nature which is of peace and tranquility. Our minds reflect what our senses absorb from the outside. When we turn the mirror inward our true senses appear which at first may seem gross and ugly, yet with further inquiry, deep down, is an unending peace. The more I continue this practice the more I want to share it with others. It seems like the yoga could be first and foremost, all else following along in this wake of understanding. I went back to the studio at 8:40am because Tim said he was going to sing the Hanuman Chalisa, a traditional Hindi song dedicated to Hanuman, the half monkey man who is the ultimate embodiment of the devotee. Tim played the harmonium and he was accompanied by an acoustic guitar and acoustic bass. There was over 50 people there in between the transition of the 7 & 9am class. INCREDIBLE!!!!! The energy was tremendous. Only in Tim’s shala!!! We then got into our Mysore practice. I got to set up next to an old friend who busted out a flawless 3rd series. Truly inspirational. I got a few key adjustments in Bekasana(frog), Karandavasana(duck) and in drop backs. I peeled myself off the floor from a long savasana and am now diving into breakfast. What a day. Right now I am just squeezing in some writing before heading to Tim’s house for a dinner get together. All the trainees are invited to come over to socialize. I am looking forward. The afternoon was really good. We sang some songs to honor Hanuman as Tuesday is the official Hanuman day. I am really beginning to appreciate singing these devotional bajans. We covered some more alignment and adjusting techniques for the standing poses and we are up to Utthita Trikonasana. (extended triangle) I am looking forward to seeing Tim and his Carol in their home.